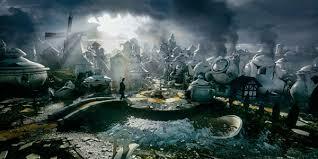 The concept for Oz the Great and Powerful had me from the first time I saw the trailer. 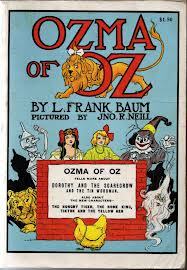 I LOVE the Oz books by L. Frank Baum. They're playful, whimsical and so much fun. Why haven't more of them been made into movies? So it was with a giddy sense of anticipation that I shepherded my kids into the theater and settled in for something that would be magical, perfect, delightful and....cue the sound of wheels screeching on pavement. The most charming, and Baumesque part of the movie was the discovery of the China Doll in a broken China Town. From there it went downhill. And by downhill I mean the kind of movie that caused me to semi-surreptitiously dig in my purse to check the time on my phone, offer to take people to the bathroom "No really, I'll take you. No problem," and fidget so much Child #1 told me to sit still. To me, the movie felt like a mash-up of memorable scenes and characters from other profitable movies in recent history. I could imagine the director saying, "We need a Shrek-style Donkey character. Stat! How about a goofy talking monkey? Perfect!" In my imagination both directors and doctors say 'Stat'. This sort of borrowing continued right up to the grand finale witch duel with streams of light shooting out of wands in an apparent homage to Harry Potter. I know the old adage there's nothing new under the sun, but my biggest problem with this movie is Baum's work is so original and creative there's no need to strip it down and dress it up. Even stranger, given the American obsession with all things new, next, creative and current, I would expect Hollywood to play up the unique aspects of the work instead of serving up tired old rehash. It's not just our taste buds for food that have grown adventurous, it's our taste buds for life. Not surprisingly, the movie hasn't received much in the way of critical acclaim. As for me, I'm still crossing my fingers that Ozma of Oz will be made into a movie, with all the charm of the novel firmly intact. Labels: Alternate title suggestions. Oz the Boring and Insipid. 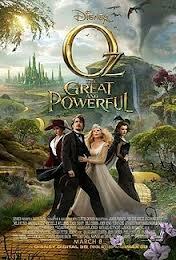 Oz the Manufactured Blockbuster that Wasn't. Oz the Movie that Caused Baum to Roll over in his Grave.